We recently had a bull calf hit the ground that has stumped us. We AIed this cow to a dark Murray Grey bull, MCC Trigger's Champion, last year. We were fairly sure that she came back into heat and was bred to our silver herd bull, BB Uncle Tony. A calf from the AI mating would have been due on February 28th, and a natural service calf would have been born in the 21st of March. 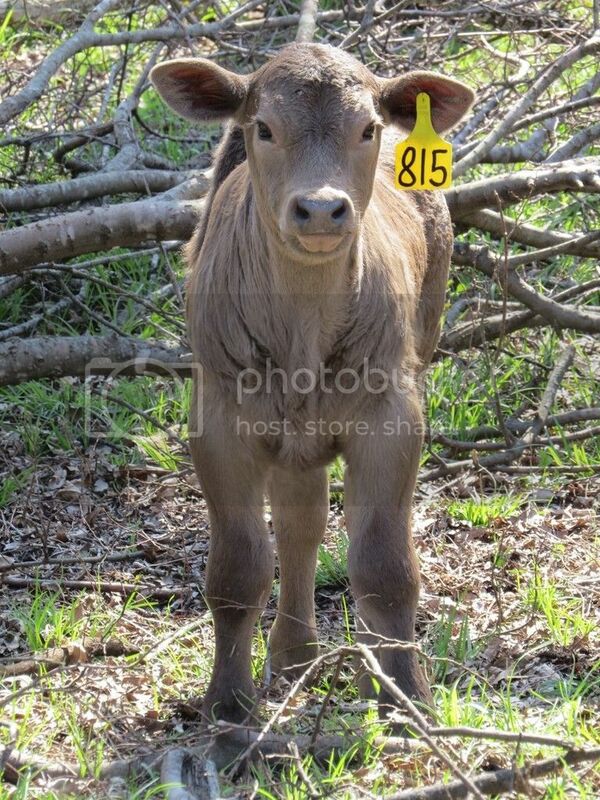 This bull calf was born on March 15th at 88 lbs. 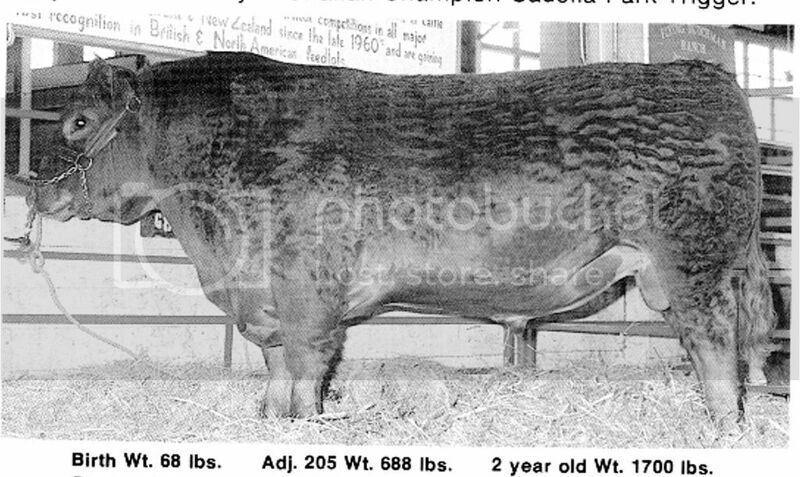 Historically, this cow has given birth early almost every year, but her calves from various bulls have ranged from 62 to 72 lbs. We have had two calves sired by Trigger's Champion so far, a 78 lb bull and an 80 lb heifer, both of which were out of smaller cows. 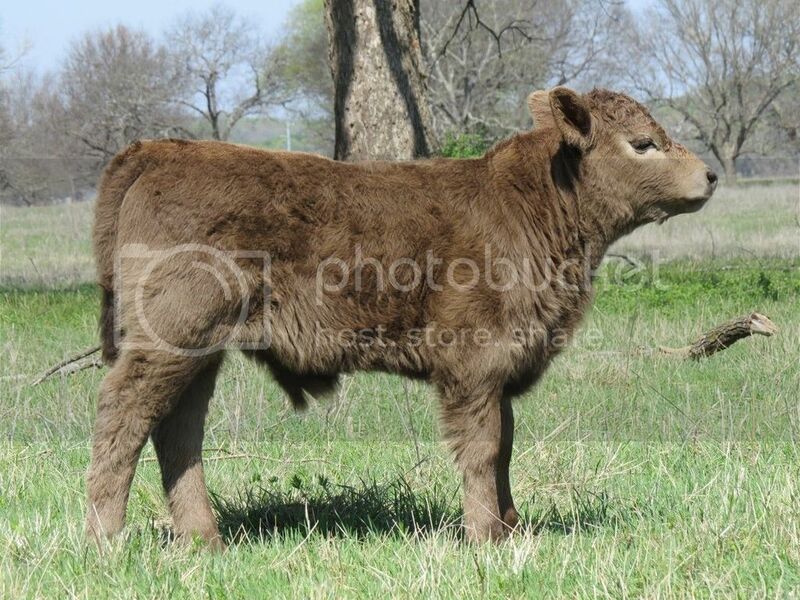 I am fairly positive that this calf is sired by Tony, but I was not expecting this coat color or ear to be honest. He is 2 weeks old in the pictures. What do you think? We will be DNA testing him at weaning if he makes the cut as a replacement. And here he is next to his mother. And the two potential sires. The first bull is Trigger's Champion and the second is Tony. My guess would be sired by herd bull. Let us know results. My money is on the AI mating. Ripper of a calf. I would also say the AI mating. Due to the size and the fact that it was only 2 weeks late. Are Tony's calves usually lighter colored? What about their normal birth weight? Will be interesting to see which it belongs to. Because I know you want it to be Trigger's, I'll do you a favor and tell you it's Tony's 100% guaranteed. When I'm proven wrong.... don't forget to tip. Thank you for the input everyone. Son of Butch, you actually got me to laugh. Farmerjan- Tony's calves when bred to light silver cows, like the ones standing behind the bull calf's mother, have been 100% silver. 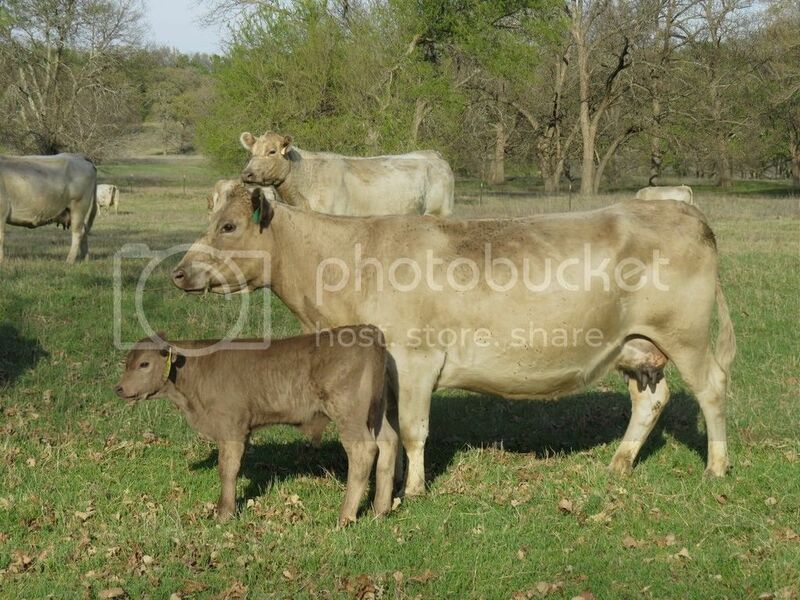 We get 50% silver and 50% brown/steel grey when Tony is bred to our brown Angus/Murray Grey cross cows. This particular cow is just a shade darker than the majority of our herd, but she is significantly lighter than our Angus/Murray Grey crosses. 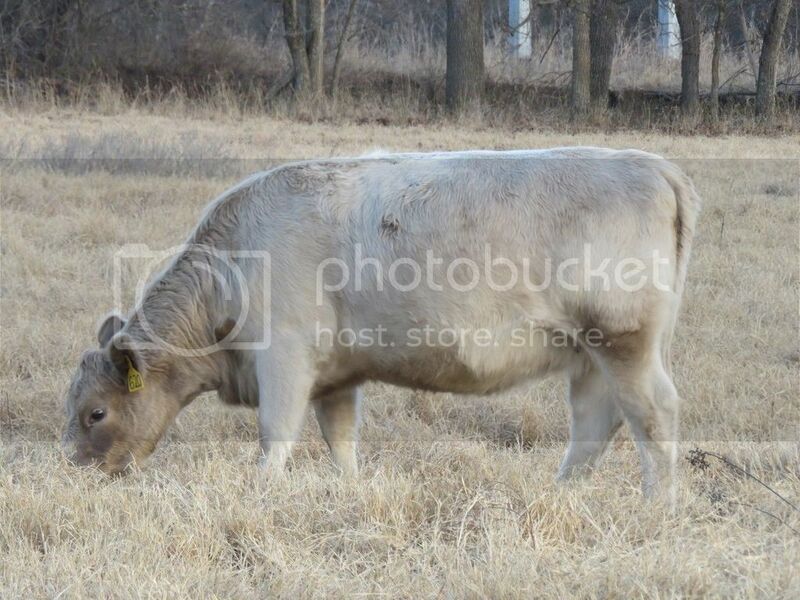 When bred to silver bulls in the past, her calves have been either a light silver or the same color as her. Historically, Tony's calves have averaged 75 lbs at birth; he has been bred to first-calf heifers and proven cows and his calves have ranged from 46 to 102 lbs. This spring, his bulls have averaged 77.5 lbs and his heifers have averaged 74.5 lbs. 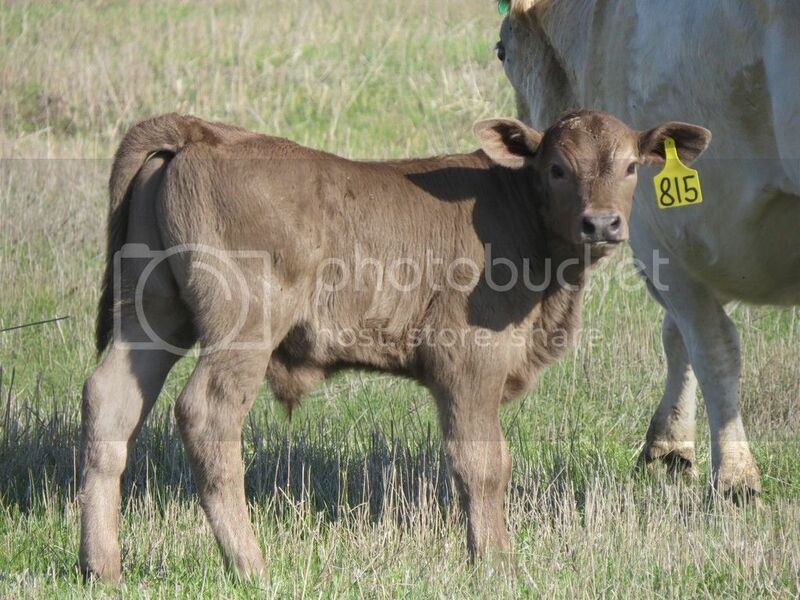 This calf is definitely well in the color range to be a Trigger's Champion calf. We have two of his progeny on the ground currently, and both are out of light silver cows. One is about a month old and the other is currently a 2 year old. As I said before, this one definitely has us stumped. Beautiful animals! Funny, I was researching my Belties and found an article that said they are closely related to Murray Greys. Nice cattle as always. Are many that dark colored at birth? RanchMan90 wrote: Nice cattle as always. Are many that dark colored at birth? Murray Greys can range in color from silver to black, and you can get almost any color in-between to tell you the truth. Our herd is predominantly silver. We have a handful of dark cows that are percentage Angus, but the mother of this bull calf is the darkest purebred cow in our herd. At birth, all of our purebred calves have been a silver/light grey until this year. 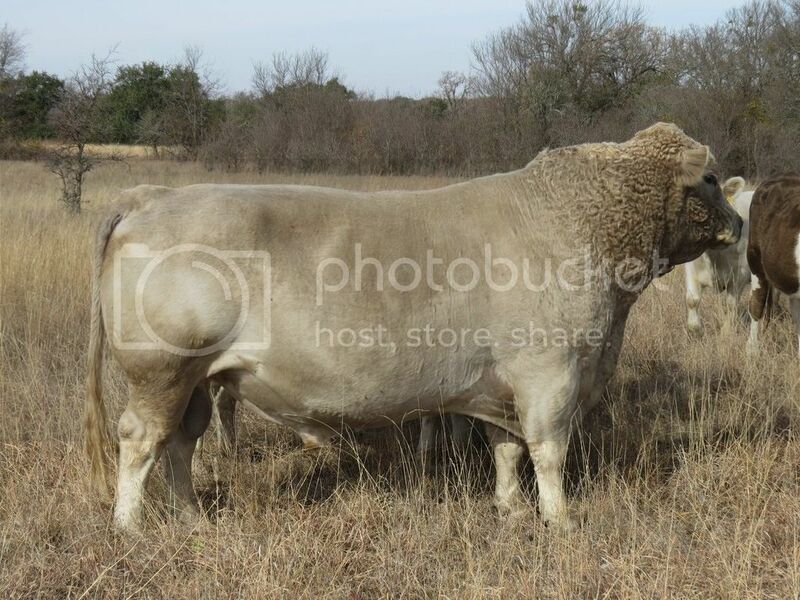 We have started AIing to a few darker Murray Grey bulls in order to improve the pigmentation in some of our females. I thought that I would update this thread. We received the DNA results back on this bull calf just last week. He is sired by MCC Trigger's Champion. He just hit 5 months old and will be weaned in late October or early November. Son of Butch wrote: Because I know you want it to be Trigger's, I'll do you a favor and tell you it's Tony's 100% guaranteed. Surely a keeper. On daddy, check the pedigree. You never know when a quirk will show up in an offspring. I do grade animals but have friends who do registered stock and an odd ball will pop up every now and then, like a Red Brangus calf show up in a Black Brangus registered herd.